The What: Velocity is Atlona’s all-new AV system control platform for Atlona and third-party products in commercial AV environments ranging from individual meeting rooms to an entire campus or enterprise. The What Else: Velocity is comprised of three distinct elements that work together as a single, unified platform: Velocity Control Suite, Velocity Control Gateway, and Velocity Touch Panels. 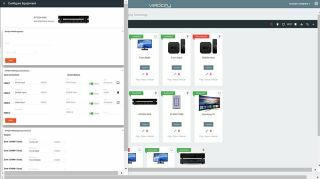 The Velocity Control Suite is a cloud-based service and centralized resource for integrators to create and manage their AV control projects by client, client sites, and specific locations such as rooms. An integrator accesses the Velocity Control Suite through a standard web browser from any location worldwide. AV control system configuration features familiar interactions, flow, and visual elements of a web or mobile application. No compiling or device uploading is necessary, and configurations can easily be duplicated across devices, rooms, and sites. Getting started with Velocity only requires online training and certification; no prior programming knowledge is needed. The Velocity Control Gateway is a software-based control processor that resides onsite with the client’s AV systems. It is configured and managed remotely through the Velocity Control Suite. Atlona offers the Velocity Control Gateway as a server appliance that can interface with up to 500 devices. For enterprise-wide scalability, a software license of Velocity Control Gateway is also available for hosting on IT server infrastructure, with the capability to serve up to 5,000 devices. Velocity Control Gateway features an IP-based system architecture that allows full redundancy in facilities with two gateways in operation, one serving as the primary and the other as a backup. This keeps AV control running continuously in all rooms, preventing disruption and user frustration that often leads to meeting or class cancellation. For user interaction with AV systems, Atlona offers Velocity touchpanels in 5.5- and 8-inch screen sizes. Additionally, the Velocity Control System allows BYOD integration with tablets, smartphones, and laptops, as well as PC desktops and touch displays. The intuitive web-based GUIs are automatically generated by the Velocity Control Suite, and accessible to the touchpanels or BYOD user devices through the Velocity Control Gateway. The Bottom Line: To be introduced at ISE 2017, the Velocity Control System is designed for fast, agile AV system configuration and deployment, plus centralized management for multiple clients and site installations. It also features a cloud and premise-based system architecture with unprecedented scalability up to 500 room systems or more, as well as full redundancy capability that prevents AV control downtime in any room. Velocity includes Atlona’s 10-year limited product warranty and customer support, and will be available in Q2, 2017.